Have you ever wondered if your life mattered? If you made a difference. I taught for over thirty years. Never was I nominated as teacher of the year. Maybe once someone put my name in for teacher of the month. Without accolades, life went on. Sometimes I overachieved as an instructor. Sometimes I slid by. In truth, I did the best I could as the person I was. Then I retired. 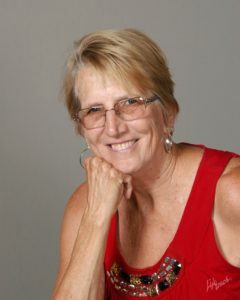 Not too long ago, Book Reader Magazine published an article about me (https://bookreadermagazine.com/featured-author-carol-mccl…/…). Friends picked up on it and shared the information. The feedback I got from students was insane. I never knew how many I had touched seeing it’s not in our DNA to gush over people from our past–to track them down and say kudos to you. Recently I read about a bedraggled man in Sydney, Australia who, in obedience to God, witnessed to one person a day. At a revival meeting in Liverpool, England, three people on three different nights talked about a man from Sydney who witnessed to them. This poor man impacted the lives of at least three people. He had no way of knowing the changes his obedience brought about. We rarely hear about the impact of our hard work. Still, like the proverbial tree falling in the forest, it makes a noise whether or not we hear it. (Sorry, philosophers, laws of physics say it makes noise). So, too, our good works have an impact. (And God sees them). “Are not two sparrows sold for a penny? Yet not one of them will fall to the ground outside your Father’s care” (Matt. 10:29, NIV). Ecclesiastes 11:1 tells us, “Ship your grain across the sea; after many days you may receive a return.” For the man in Sydney, he literally shipped his words across the seas. 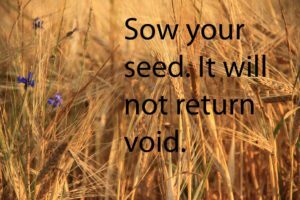 For all of us, we do not know what things we do will reap rewards. We need to keep doing them. God sees. His eyes are on the sparrows. Therefore, He sees us. Your life matters. God sees even if no one else does.